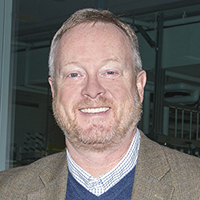 Dr. David M. Simpson is the Polyethylene Products and Applications Development Manager for ExxonMobil Chemicals, located in Baytown, Texas. David started his career in 1993 at Norton Performance Plastics Corporation in Wayne, New Jersey as a Process Engineer in the fabrication of fluoropolymer films. In 1994, he moved to Union Carbide Corporation in Bound Brook, New Jersey in polyethylene product development. He played a key role in understanding polymer composition - structure-property relationships in new polyethylene products. In 1997, he became part of Univation Technologies, a joint venture between Union Carbide and Exxon Chemicals. In that role he was responsible for new product development and support for technology licensing efforts. In 1999, David joined Quintec Films in Shelbyville, Tennessee as Technical Director. At Quintec, David developed novel 7-layer polyethylene film constructions for food packaging and pallet unitization. In 2000, David joined ExxonMobil Chemicals in polyethylene product development. In 2001 he started in a series of commercial roles that included market development, supply chain, product management, and financial planning management. In 2010, he returned to a technical role as the market-facing manager for customer support for North and South America. In 2010, he became the global product development leader for new polyethylene products. David obtained his B.S. degree (1989), M.S. degree (1991), and Ph.D. degree (1993) in Polymer Science from The Pennsylvania State University. His graduate work under Prof. Ian R. Harrison involved processing-structure-property relationships in polyethylene blown films supporting a NASA-funded program in high-altitude balloon films.